What is it? A supernatural coming of age mystery. Oxenfree is a supernatural adventure game about a group of teenagers who unwittingly disturb something ancient and mysterious on a remote island. It’s the familiar premise of countless straight-to-video horror films, but this is no clichéd homage to teen slasher flicks. It’s a game about people, relationships, and growing up that cleverly uses its horror movie setup for something much greater. You play as Alex, a blue-haired teenager who comes to Edwards Island with a group of friends, and her new step brother, to hang out, drink beer, and explore. A local myth is that if you tune a radio into certain frequencies on the island you’ll hear ghostly messages—an urban legend Alex and her friends decide to investigate. I won’t say what happens next, because this is a story-driven game and unraveling its mysteries is key to the experience, but their evening suddenly takes a dark turn. The group becomes separated, and Alex takes it upon herself to find her friends on the eerily quiet, empty island. It has a storied past which you learn as you wander. When you see a sign with a certain icon, you can tune your radio into a frequency that reveals the island’s history—including a story about a tragedy involving a World War II submarine. On the island you'll find, among other things, an abandoned military base, a campsite, a forest, and a small, uninhabited town. It’s not a massive space, but makes up for its limited scale with rich world-building. You can explore it freely and, in some cases, choose the order you tackle objectives. Early on, when you’re first separated from the group, you can choose which of your friends to look for first—and this will change the way the story plays out, and even their relationship with you. In fact, everything you say or do influences what the others think of you. But there are no meters, icons, or messages flashing up saying someone will ‘remember that’—you have to gauge what they think of you through their actions and dialogue. This is opaque by design, simulating the subtlety of actual relationships. Sometimes a thought bubble will appear above a character's head: a visual indicator that they're retaining information that's somehow meaningful to them about the character whose face appears in it. Accompanying this relationship system is one of the most natural-sounding dialogue systems I’ve ever encountered in a game. Often, conversations in video games sound like two people taking turns to read out lines. But in Oxenfree the lines flow together seamlessly, and you can respond at any time by selecting one of three answers. The characters will even react to your silence if you don’t answer them, or if you decide to walk away and ignore them. This, combined with fantastic writing and voice acting, makes Oxenfree one of the best virtual recreations of real humans talking to each other—which is lucky, because the dialogue is almost non-stop. The five characters are well-rounded and have distinct personalities. Early on, before things start getting supernatural, they play a game of ‘truth or slap’—it's like truth or dare, but with slapping—and it’s a wonderful scene that reveals a lot about the cast and what makes them tick. It’s also interactive, and can play out a number of ways. Ren has a crush on Nona and asks you not to tell anyone. You can reveal this during the game, much to Ren’s dismay, or change the subject to protect his secret—and he’ll remember your decision, which shapes his opinion of you. An achievement suggests it’s possible to make everyone in the group hate you by the end of the game, but I never managed it. I like Ren too much to be mean to him. 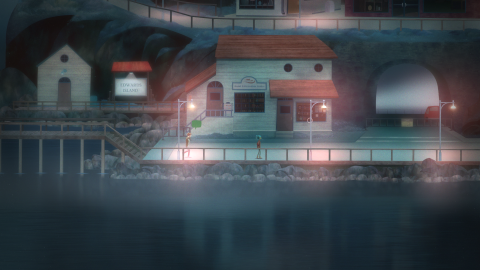 Outside of the character relationships, there isn’t much to Oxenfree. It has adventure game stylings, but there are no real puzzles to speak of. It’s mostly a game about exploration and story. Your predicament has close ties to the island, and also your own past. Alex’s journey is an emotional one, and she’s forced to confront difficult things in her life. The story is short—you’ll finish it in about six hours, maybe more if you decide to look for optional letters scattered around the island—but it’s superbly paced and written, and you’ll immediately want to play it a second time to see what other paths you can take and the different directions your relationships can go in. It’s funny and occasionally touching, but not scary, despite being, essentially, a horror game. One moment made me lean back in my chair and wince, but otherwise it’s fairly tame. But that’s fine. I was so entranced by the story and characters that I didn’t really care. Oxenfree uses its setting and atmosphere as a means to tell an intriguing, heartfelt story, rather than for cheap scares. You start out thinking it’s going to be the typical story of a group of feckless teens being picked off one by one by some evil force, but it subverts that trope. It's a difficult game to review, because revealing so much of what makes it great would ruin the story. But if you like smart, well-written adventure games with rich characters, well-realised settings, and beautiful art direction, it’s worth playing. My only real complaints are the lack of challenging puzzles, and the fact that the characters often seem a little too relaxed considering the terrifying things happening to them. If it was me I'd be sobbing in a corner somewhere.